Nothing much to say here other than to make sure your data follows the constraints you set when you created the fields in the tables. Now I want to know how many items each User sold and how much money they made each for those sales as totals. So this is the data we want. We want the user’s name as well as the Total Stock sold (this would be a sum of the items they sold) and a total dollar amount that was sold per person. Now that we know what we want we now need to build a query that gets us this information. The above gives us every user in the Users table and displays their name like Smith, Bob. We also gave the @Users table an Alias of usr. This becomes important in future steps since we will need to reference this again in our sub queries. Sub queries are always encased in parentheses. So this query uses the SUM function on AmountSold From the @Sales table. We also give this table an Alias. SUM will take every row in that column (AmountSold) and add them all together. However since we want to only sum the AmountSold and have it displayed for the correct user we have to tell it to only sum it up for the current User we are on. So we add in a WHERE clause and tell it to do it on records that match. 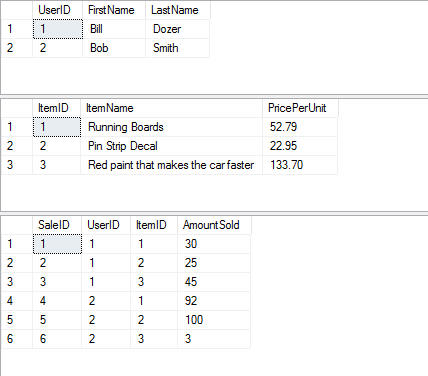 So in this case we want it to only SUM where Sa(@Sales table) UserID matches our usr(Users table) UserID. This is why I said the Alias prior was important since we have to use it to do the matching. This query works much like the other however now we are doing some multiplication in the SUM function. We multiply those 2 fields together and them sum all those results together to get the total Sales for that user. The key difference in this one is that we are also now a JOIN. JOINs are important when you are trying to select from more than one table. In this case we want to match records from the @Sales table and the @Items table. The reason we do this is because we need the PricePerUnit in order to do our calculations.